With the continued rumors of a Surface Phone coming, we’re still hearing other rumors, and the latest Windows 10 Mobile device leak may be an indication of the best flagship yet. According to the spec sheet, the 5.8 inch device is sporting a 2560 x 1440 pixel display, with a Snapdragon 820 processor and Adreno 530 GPU. 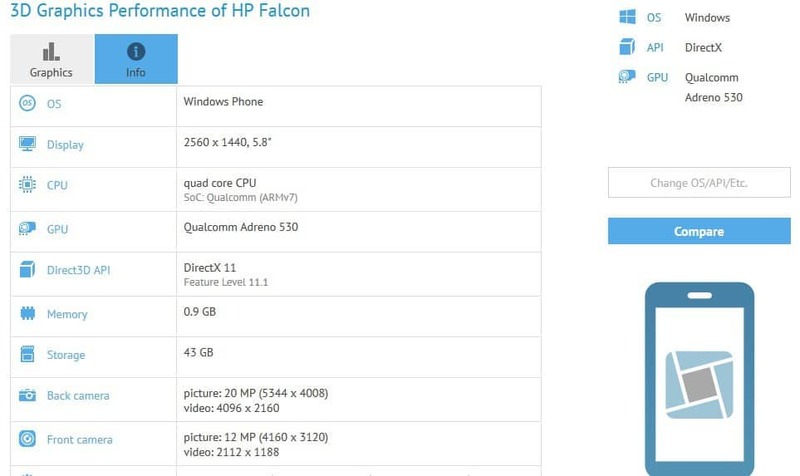 GFXBench shows the device as the “HP Falcon,” although the name is likely meant to throw off people as no evidence or announcement by HP of making a Windows 10 Mobile device (unless they are resurrecting the Palm Pre). The device will also have 43 GB of internal storage, and 0.9 GB RAM, although those numbers will likely change as they only indicate the numbers available at the time of the benchmark testing. The Windows 10 Mobile device will also have a 20 MP rear camera and a 12 MP front-facing camera to take the most up-close-and-personal selfies. The display resolution will also change, once more details come out for this Windows 10 Mobile device. Microsoft is also testing a phone based on the upcoming Intel chip, alleged to come out sometime in the second half of 2016.We’ll just have to wait and see as more details on the “HP Falcon” surface. Could this be the Surface Phone?